I managed to paint my Adeptus Mechanicus War Convocation. They are all black now! And no, they are not the Dark Mechanicum. Black is cool and the main color for the Forge World of Draconis IV, as well as House Yato, the Knightly House of Draconis III. So they're black. Yay. Black is the new cool. A full force of the Adeptus Mechanicus War Convocation! I didn't just paint them, I also got my hands on blu-tac. It's a very useful tool for customizing my models and turning my army into a flexible force with many options for weapons. Kataphron Destroyers with both plasma culverins and heavy grav-cannons. The Kataphron Destroyers didn't have their plasma culverins glued on for a reason. 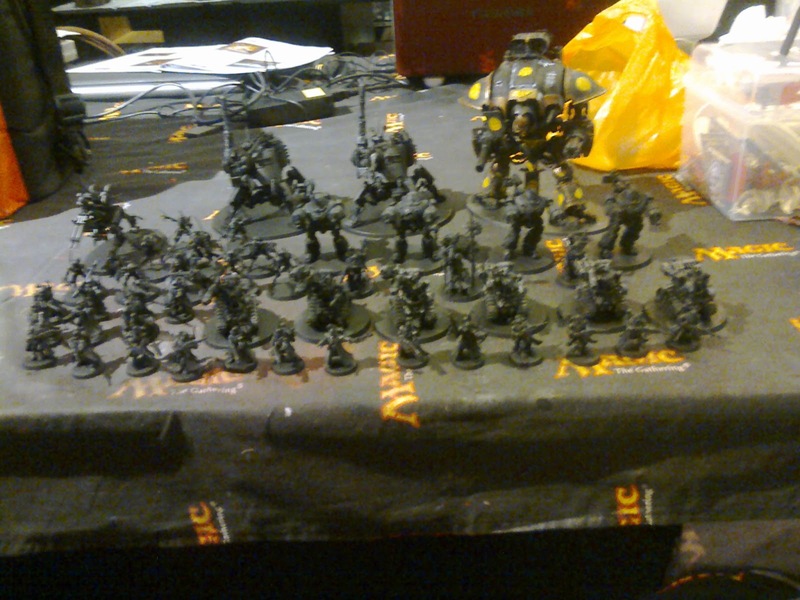 I was planning to either magnetize them but someone from Battle Bunker suggested I use blu-tac instead. And it works! It's a lot better than gluing them on or using magnets. I can swap out the weapons whenever I want. So now my Kataphron Destroyers have both their plasma culverins and heavy grav-cannons. I kind of used blu-tac to stick the second weapon to the side so it looks like they have both, but obviously game-wise I can only choose one of them. It should be fine. 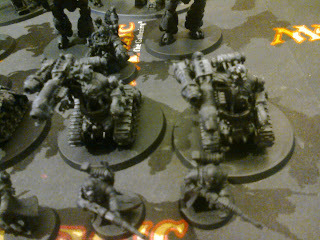 Onager Dunecrawlers with multiple weapon systems! I did the same with my Onager Dunecrawlers. 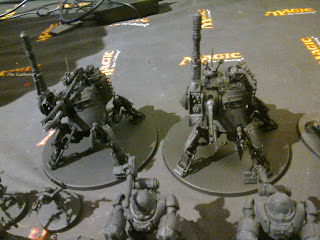 I used blu-tac to give the Onager Dunecrawlers both the Icarus array and the neutron laser, so now they can use both! Um, not really. In game, I have to choose one, and I will let my opponent know whcih one it is, but for now it's a laugh to see my own unique Onager Dunecrawlers equipped with both the neutron laser and Icarus array cannon. Funnily enough, it sort of makes sense... when the Icarus array missile pod is closed, the neutron laser swings down to point at the front instead of above. So yeah, if the Onager Dunecrawlers use the neutron laser, they can't fire the Icarus missiles and rockets. If they're using the Icarus array, the neutron laser is pointed upward and can't fire forward. So it sort of makes sense. Except that where is the power for the neutron laser coming from? Ready for battle! Actually I still have one last Onager Dunecrawler to build. As usual, nobody reads this blog and nobody offers any advice so I ended up making the decision myself. Anyway, the staff at Battle Bunker already recommended me to have 3 Onager Dunecrawlers to make full use of the Field Harmonics so that the emanatus force field confers a 4+ invulnerable save for all 3 of them. Besides, I like the Onager Dunecrawler more than the Ironstrider Ballistarius. The flexibility of 3 Icarus arrays or 3 neutron lasers, complete with a 4+ invulnerable save, better front and side armor than the Ironstrider Ballistarius's AV 11, surpasses the poor Ironstrider Ballistarius in every way. I can't wait to try them out in a game! By the way, I've finished reading my Japanese light novel so it'll only be a matter of time before I finish the Starfist novel I'm reading right now and move on to the Mars trilogy. In the meantime, I'll be continuing reviews for the Ciaphas Cain series and Mechanicum by Graham McNeill. Maybe I'll throw in one for Ice Guard, but not Dead Men Walking as I no longer have that book (and I didn't like it). I'm daunted by the prospect of following Gaunt's Ghosts, so I probably won't read much of them for any reviews, but if there are other stuff you think I should read, please go ahead and recommend me. I avoid Space Marine novels because of how generic they are and I prefer to read about the Imperial Guard and Adeptus Mechanicus (I really prefer the underdogs, and Space Marines always tend to be the damned heroes who save the day). Um, I don't know if I should write a review for the Grey Knights omnibus by Ben Counter - as I said, I don't really like Space Marine novels, but Grey Knights tend to be an exception beacuse of their whole anti-daemon and daemon hunter lore, plus rather than be grown in vats by gene-seed and stuff, the Grey Knights are recruited by getting psykers and then performing surgery on them. I think. I'm not sure, so please correct me if I'm wrong. 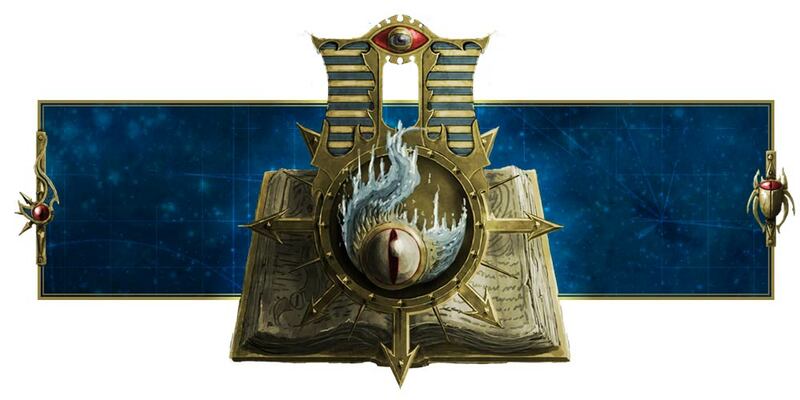 Anyway, unless I get feedback and comments requesting a review for Grey Knights omnibus, I probably won't write a review for them. Besides, there are already countless reviews about the series that are writtern far better than anything I can write, so it's fine. I'm just writing book reviews about the series I love for the fun of it rather than any real need to inform people about how good they are. The Grey Knights omnibus and Dead Men Walking turn out to be extremely dark, too dark for me, which is why I'm not enthusiastic about writing stuff about them. I really enjoyed the Grey Knights omnibus and it was a fun read, but really, the ending of Hammer of Daemons turned me off. One thing about Space Marines novels that I really, really find unpleasant is the way they treat the Imperial Guard as mere fodder. To me, the Imperial Guard are ordinary men and women, each with their individual lives, hopes, dreams, despair and fear. That is why the Imperial Guard novels and series are much more appealing to me. Well, I'll read Gaunts's Ghosts one day but the sheer number of volumes that I need to start reading puts me off. Dan Abnett is a good writer, no doubt about that - I really loved his Titanicus - but there are far too many Gaunts's Ghosts for me to follow, and I'm very particular in that I must absolutely read them in order (which is why I waited for Priest of Mars instead of reading Lords of Mars and Gods of Mars despite getting my hands on them first). With a few of the volumes out of print, and me being reluctant to read ebooks (my eyes can't take it), it's really a daunting task to start following Gaunt's Ghosts. That's why I'm very angry with the disrespect and casual disregard of the Imperial Guard in most Space Marine novels. They are treated as cannon fodder, killed off horribly wihtout being given a fighting chance. I don't want to spoil Hammer of Daemons, but the Imperial Guard characters weren't even given a fighting chance. They were so well developed, so well written and so relatable I couldn't help but love them, feel for them and cheer for them despite Alaric being the protagonist (and he's a Grey Knight). In fact, I actually like the Imperial Guard characters more than the complex and growing Alaric, who despite his flaws and ruthlessness, is actually a likeable character. However, Alaric's glaring "betrayal" or abandonment of the Imperial Guard characters at the end, and the manner in which the hope I had when they escaped Khorne's world was cruelly dashed, destroyed any like or enjoyment I had from reading the book. After overcoming so many trials and obstacles in Khorne's world, the way Ben Counter callously killed off the Imperial Guard in the Hammer of Daemons by use of a stupid daemon was just....yeah, callous. And once again typical of how the Imperial Guard are treated in most Space Marines novels. They valiantly fight, out their lives on their line, have hopes and dreams, are used without regard by the Space Marines, sometimes even help and save the Space Marines, but in the end they are coldly discarded to one side and killed off for no other reason than because the Warhammer 40K is "grimdark". I'll just amuse myself with Ciaphas Cain, thank you very much. This is also why I like the Sanctus Reach campaign. Castellan Jakren Stein actually saved the Space Wolves from daemons, the Imperial Guard rolling their heavy armor and artillery in to blast the invading daemons to bits and rescuing the Space Wolves, particularly Logan Grimnar and Ragnar Blackmane from a massive daemonic engine. I also loved the addition of the Knight houses, normal men piloting massive suits of armor to fight alongside their Cadian allies to stem the green tide of Orks that seek to destroy Alaric Prime. Their battle was a great and fierce one, not as one-sided slaughter as the Tyranids devoured the Imperial Guards and Sisters of Battle defending the Shield of Baal. And unlike the Shield of Baal campaign, the Imperial Guard rescued the Space Wolves unlike the Imperial Guard in Shield of Baal needing to be rescued by the Blood Angels. I'm hoping for another campaign like Sanctus Reach where the Imperial Guard fight alongside Imperial Knights and perhaps the Skitarii and their Adeptus Mechanicus masters, the Tech-priests. Maybe I should try creating my own campaign. We shall see. Ha ha. I'll complete War Convocation before attempting to outline a campaign like Sanctus Reach. For now I'll look forward to completing my Adeptus Mechanicus army. The only thing I'm missing now is a Titan! I need a Warlord Titan to represent the Collegia Titanica in Draconis IV, the Legio Draco. The problem is, I can't afford a Titan in real life, with the Forge World charging over a few thousand dollars for a single Titan model. So...I'll see what I can do.